In recent years, more sophisticated hydraulic products are constantly introduced into the market, encouraged by technological innovation in its field. However, regarding solenoid directional control valves, the conventional spool type is still the mainstream, and its fatal problems such as internal leakage and shocks when switching the direction are no yet solved. LSL-55 is a leak free shockless solenoid directional control valve and developed by using our own unique technology. 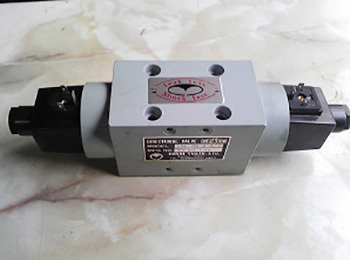 LSL-55 completely prevents internal leakage and eliminates shocks when switching, and has earned an excellent reputation as an innovative directional valve in various fields. leakage Plate type slide valve prevents internal leakage. Shocks are eliminated due to the low changing ration of passage cross section when switching. No more glitches caused by internal leakage when in neutral position, which are often experienced with conventional directional valves. Due to spring tension, a ring cup is attached to plate type slide valve all the time and slides. The self compensation effect on sliding surface ensures LSL-55 a long life. Without the needs to incorporate anti-leakage or shock absorbing devices, a circuit became very simple. Without damages to the piping system caused by shocks and oil leakage, its maintenance is very easy. Intermittent operation is possible due to complete pressure holding. It prevents power loss and heat generation. Different from the conventional spool type directional valve, its body can be split into 3 parts to make it replaceable. It is very economical.